The game is about you taking care of, training and competing with horses. By winning competitions, your horse's value increases and thus you can buy more expensive and bigger horses. You train and compete in jumping, dressage and terrain rides. There are 8 different courses for each step for a total of 24. In order for the horse to exercise and compete, the horse must have energy. The energy is the total value of the horse's needs, love and hunger. These needs are met by the player taking care of his horse with everything it entails. The game is set on Auntie's farm, Whinnydale. Here player starts with a small horse and, by training and grooming it earns points: golden horse shoes for grooming and general care; horse coins for winning competitions; apples for solving simple timed puzzles. The horse coins are used to buy new horses, there are eight to choose from. The apples are used to teach the horse new tricks while the horse shoes are a record of the player's ability to care for the horse. The player can care for the horse themselves or choose to let Auntie do it. If Auntie cares for the horse it will always be fed, fit, happy and ready to be schooled but the player will not earn any golden horseshoes. This is not a detailed simulation. 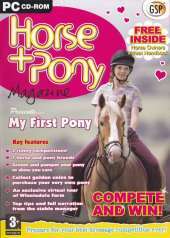 Horses are groomed and saddled, stables are mucked out with all with just a few mouse clicks. Riding however is keyboard controlled, left/right arrows steer, up/down alter the speed, and spacebar makes the horse jump. There are three disciplines to train in. Show Jumping and Cross Country where the player has to complete a course and finish first. Dressage where the player is judged on their ability to follow a course closely and at the right space. All disciplines are practiced in the paddock while the contests are held in the Forest Arena. Throughout the game the player is given clear audio instructions on what is expected.